Two mid-level drug dealers were arrested outside a Plutaluang temple with more than 4,000 methamphetamine tablets. Two mid-level drug dealers were arrested outside a Plu­taluang temple with more than 4,000 methamphetamine tablets. 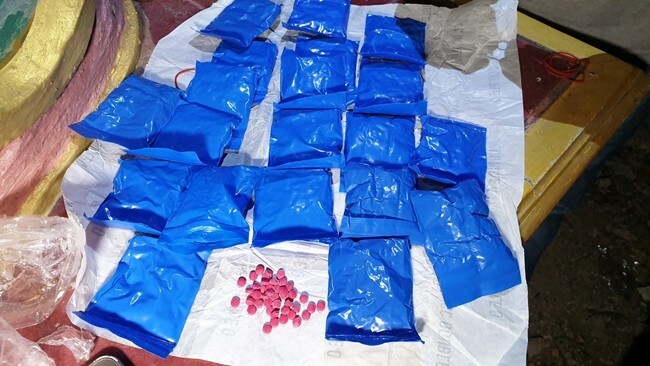 Yotin Wongwaedee, 37, and Komjit Piendee, 35, were captured in a Feb. 19 sting operation as they dropped off the 4,040 ya ba pills at the base of the Tao Wedsuwan statue at Ratsadornsamakkee Temple. Sattahip District Chief Anucha Intasorn, security officers, sailors from the Sattahip Naval Base and Plutaluang police were waiting for them. The sting was set up by Patcharee Yamsunthorn, 23, and Rattapon Chainet, 22, who were arrested earlier with 500 speed pills and ratted out their alleged dealer. The two Rayong-based suspects confessed, police said, saying they get their drugs from the ring’s top man, a “Mr. Hie”. The drug dealers didn’t apologize to police, but did prostate themselves in front of the statue of the Chinese deity, saying they feared bad luck by disrespecting it.